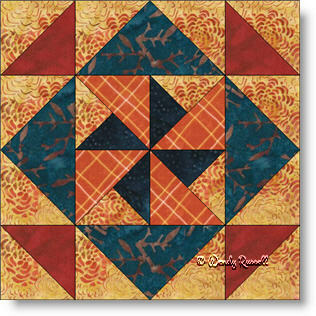 The Wheel in the Road quilt block is a simple block to make. For those new to the "3/4 square triangle", here is your introduction to that particular quilt patch, which makes up the centre of the block. Other patches include the half square triangle and the flying geese units. The sample quilts illustrated show how you could lay the quilt blocks either side-by-side or on point to achieve a different look. There is no end to the creativity in designing your own quilt.